My wife Sandy and I have a love affair going with Cape Cod, which is where we are vacationing as I type this missive. We live in suburban Philadelphia, but in most ways prefer the Cape. Boo hoo . . . we’ll be back home tomorrow. In 1998 we visited the Cape for the first time, expecting it to be a locale we’d enjoy. Well, we did. And decided to come back the next year for some more good times. 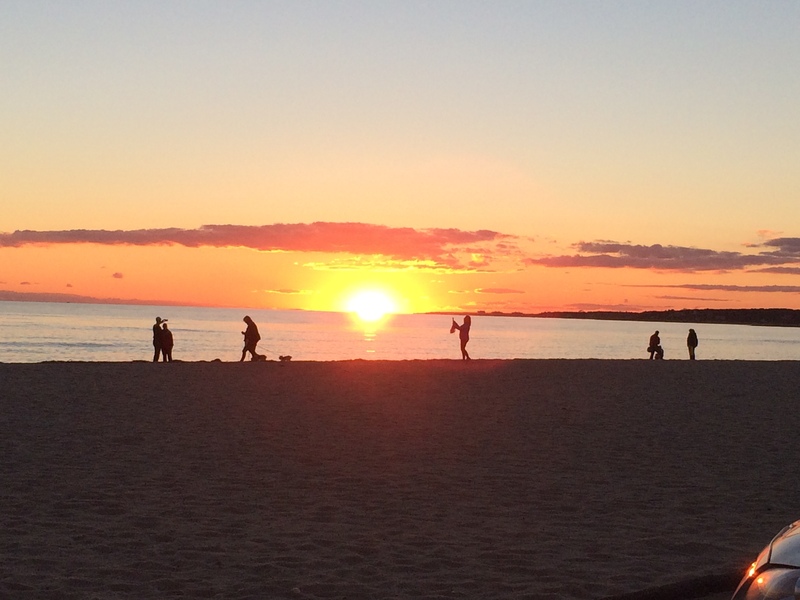 I think it was on that second trip that I realized I liked Cape Cod much more than I ever thought I would, that it really suited my soul, that I was starting to become smitten. Sandy and I have returned every year since then, excepting one. Before Cape Cod entered the picture, in my adult life it had never occurred to me that there might be an Eden of sorts waiting for me, someplace beautiful and in which I truly felt at home. A favorite place. Sandy and I have had only great vacations on Cape Cod. We’ve been there in all seasons except summer, which is the one time of year when the Cape is overrun. With humans. We fill our days with a variety of activities: nature walks on sand or through forests; poking around in country-imbued villages; art gallery and museum hopping; attending movies, plays and concerts; lots of tasty eating in restaurants humble and above; the list continues. No doubt, this is the good life. I feel almost guilty that such fine fortune has come my way. But I’ll take it. Atlantic Ocean shoreline. Eastham, Cape Cod. If I had to select one reason above all that puts Cape Cod at the top of my list, I’d point to the expansive areas of natural beauty. Such as the 40 or more mile-long Atlantic Ocean shoreline, much of it government-protected and thus little disturbed or altered by the hands of man. The vistas there are pretty elemental and always knock my socks off. Ocean, sky and beaches backed by dunes-topped sand cliffs. My psychological and emotional makeups, whatever the heck they might be, vibrate in a calm, contented and awestruck manner when I’m in the midst of such. And there are other reasons. To name one: When vacationing on Cape Cod sometimes an unexpected present drops into your lap, just as with life in general. One day last week an example came my and Sandy’s way. I’m talking about a sunset. Right, right, I know that over the centuries untold thousands of scribes have oohed and aahed in print about sunsets. And millions of sunset photos have been published, more in the last 15 or so years than ever before thanks to the Web. But hey, I’m not embarrassed to add a few hundred sunset words, and a handful of photographs, to the Everest-high piles already out there. Don’t bail out on me. Keep reading. And so on the aforementioned day at 5:15 PM, Sandy and I were in Chatham, a needless-to-say charming Cape Cod town. We had just watched Steven Spielberg’s latest oeuvre, Bridge Of Spies, in the Chatham Orpheum Theater. Our next planned destination was 20 miles away, Harvest Gallery Wine Bar. There we meant to dine and listen to a tough as nails rock trio, The Catbirds. But there was no need to arrive before 7 PM. We had time to kill. We scratched our heads, coming up empty. Then “sunset” popped into my mind. Sandy checked with her phone, which is much smarter than me, and learned that the Sun would dip below the horizon at 5:57. I steered our car westward and then turned south onto a road I’d never heard of, hoping that we eventually would find our way to a Chatham beach on Nantucket Sound. The sand gods must have been with us, for Hardings Beach Road soon materialized. And moments later Hardings Beach itself emerged. We parked. The spot was gorgeous. 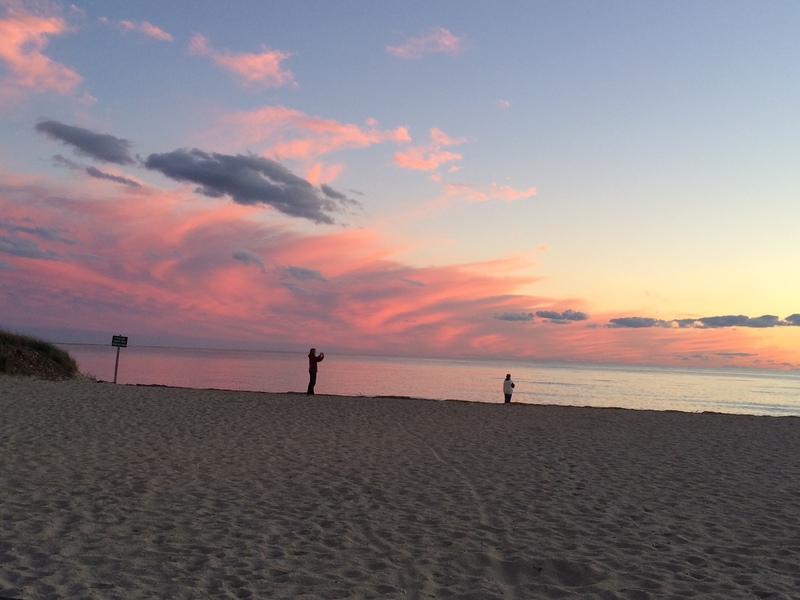 Lovely sands, magnificent Nantucket Sound waters gently rippling beneath a sky puffy here and there with clouds. 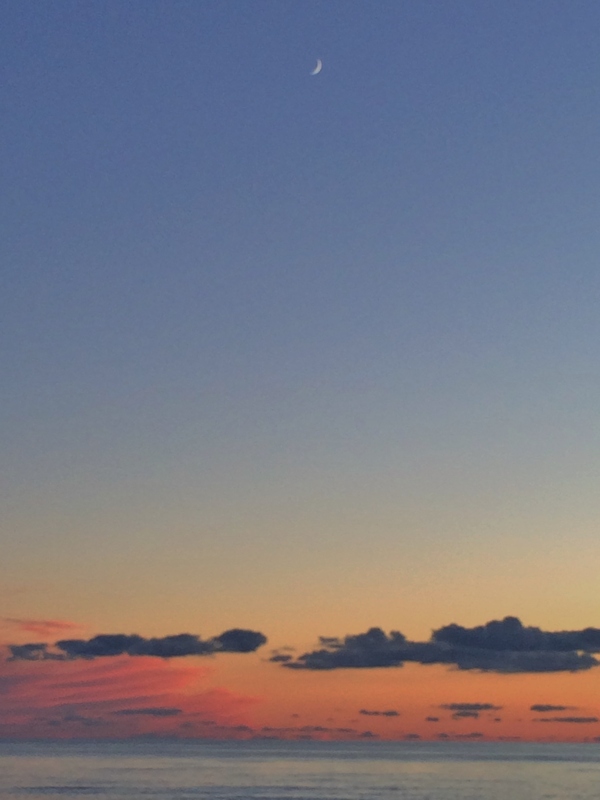 The clouds made my heart leap, or something like that, because a scattering of clouds, as I’ve come to realize from years of sunset-gazing on the Cape, is key to a good sunset. Their water droplets and other particles refract light beams and reflect colors. Their movements and changing forms turn sunsets into active canvases. And that’s what happened as Sandy and I watched our fiery faraway friend say goodnight. Sunset at Hardings Beach. 5:56 PM. Sunset at Hardings Beach. 6:05 PM. Sunset. The Moon. Hardings Beach. 6:07 PM. A lot of people claim to dislike colorful abstract art, certain paintings by, say, Vasily Kandinsky or Jackson Pollock. I don’t get that, because everybody loves sunsets, which to me can be among the ultimate in eye-popping abstractions. I’ve never read that sunsets inspired any brush wielders to go wild and free in their approach or vision, but it wouldn’t surprise me if in fact this were the case. Sandy and I watched the sky for 20 minutes. The pinks and oranges darkened as the big event rolled on. The clouds worked their wonders. And in a little while Sandy pointed up and said, “There’s the Moon.” It was a graceful sliver of white balancing above swashes of pastel hues. On Cape Cod I’ve been a lucky son of a gun many times. That evening on Hardings Beach was one of them. I just returned from leaf-peeping in Vermont and upper New York where I was overwhelmed with beauty, particularly at Ausable Chasm in NY. 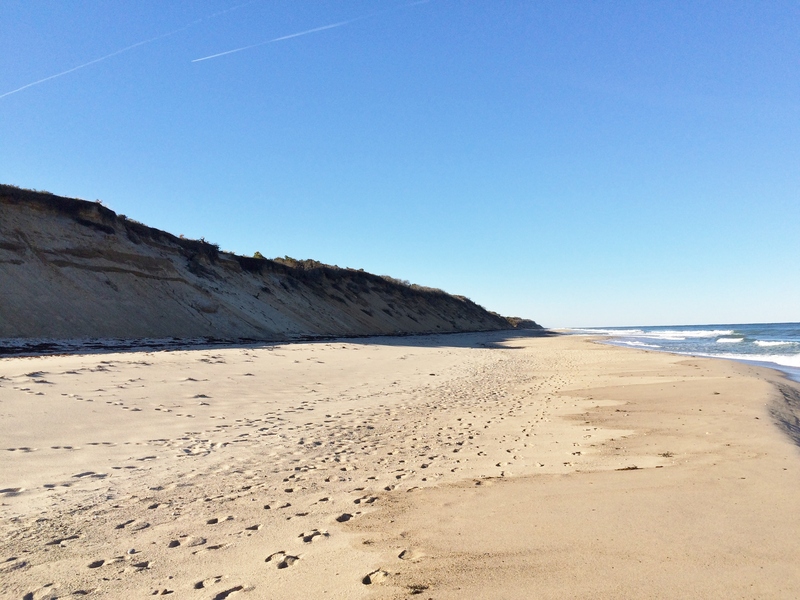 Flying home, my husband and I vowed to return to the area, which neither of us had explored other than New York City; based on conversations we had with other travelers, Cape Cod was on our list of must-sees for our next autumn adventure. I can hardly wait to show Joel this post. Janet, I’m pretty sure that you and your husband would have a fine time on Cape Cod. The beautiful waters (Atlantic Ocean, Cape Cod Bay, Nantucket Sound), among many other things, make the Cape a special place. The sunset picture at 6 05 is fantastic! Sandy is a real good photographer.